Did you know that American zoos pay a million dollars a year to rent a giant panda from the government of China? If you ask me, that's shocking fee to pay for an animal whose endangered status is a result of being too stupid to mate. But it hints at the big business that is zoology mixed with cute. Nowhere is this more evident than in Germany, where adorable lil' six-month old polar bear cub Knut is still drawing record crowds and stuffing the coffers at the Berlin Zoo. Knut became a local sensation when his circus performer mother rejected him and zookeepers, often sleeping on a mattress inside his cage, were forced to rear the infant bear. International attention followed when an animal rights activist seemed to suggest, in a quote taken woefully out of context, Knut would be better off dead than to suffer the humiliation of being a domestic pet. Soon after the controversy, Knut was photographed by Annie Liebowitz, and became the subject of several hit songs. The polar bear's biography will be released in the fall. To cash in on Knut-mania, German companies are now marketing everything from Knut chocolate to Knut ring tones. 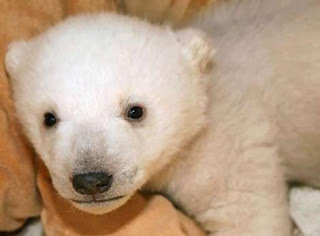 As Germany shifts from a manufacturing-based economy to a Knut-based one, a pertinent question is raised: What will become of Germany when Knut grows up and develops the unfortunate small-headed lurchiness associated with the adult polar bear? No one knows for sure, but it will be precarious times for France.